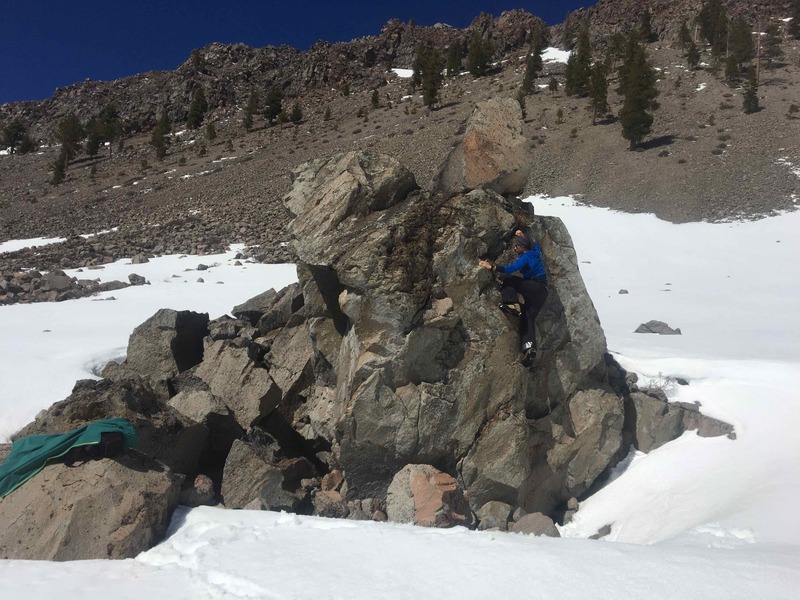 There are many options for a summit attempt for Lassen Peak. 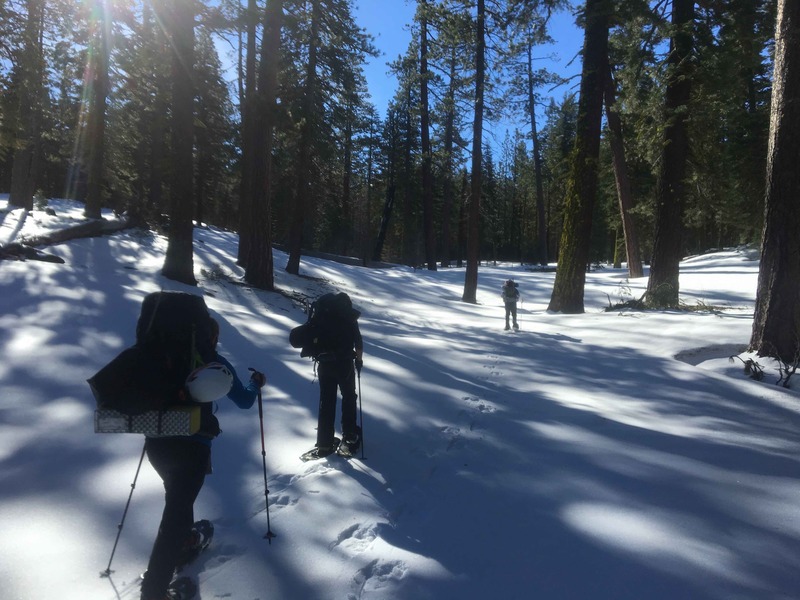 The road from the main Kohm Yah-mah-nee visitor center is typically closed in the winter so its about a five mile snowshoe or ski to the base of the peak. 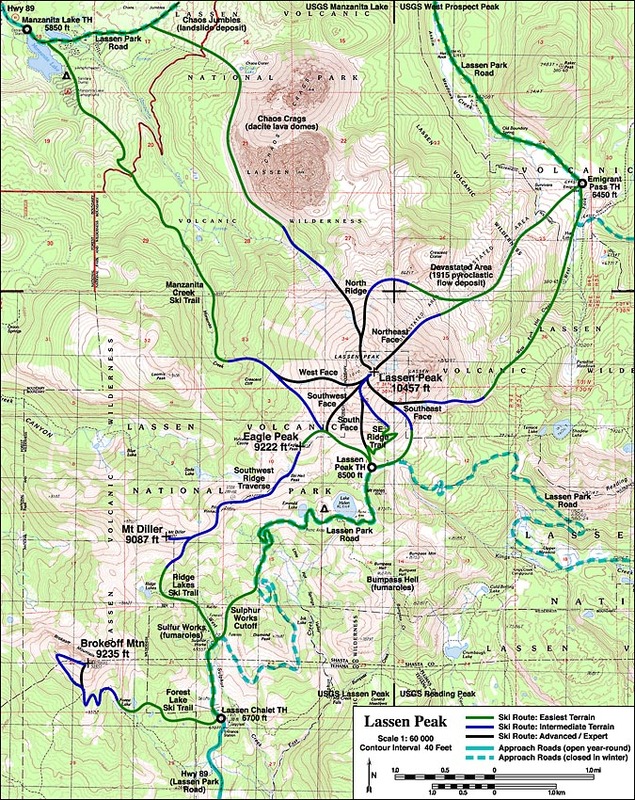 The other approach is from the North Manzanita Lake Visitor Center which offers a 2.5 mile approach and views of Chaos Craigs and Mt. Diller. We choose to start at Manzanita Lake since it was a shorter approach (our route). Arriving at around midnight we grabbed a self-issue permit from the closed visitor center and then walked into the Manzanita Lake campground. We pitched our tents in the last half snow covered spot we found and then got some sleep. Around 8am we started hiking down the Manzanita Creek Trail. After about a half mile the snow was deep enough for us to use snow shoes. The Manzanita Creek Trail slightly increase in incline a portion just before it levels out. At this flat portion we cut over towards Chaos Craigs since we thought the Northwest ridge would be more fun, less steep and have less avalanche risk than the West ridge. While cutting across this level patch we had to cross a stream which I had thought would be buried under a dozen feet of snow, but surprisingly exposed and gushing between two four foot snowbanks . The river wasn’t very hazardous but deep enough to want to avoid plunging my boot two feet through its surface to reach ground. Luckily, we were able to find a crossing point with the help of a large log and get on our way. Keeping Chaos Craigs on our left we skipping the first valley we came across to make our way towards the Chaos-Lassen saddle where a final valley would get us closest to our planned ridgeline. We stopped to set up camp just before the incline started up again in an area heavy with trees. It was around noon. It was warm and there was no point in trying to snowshoe very far in the wet snow. Likewise an attempt to go up Chaos Craigs which had shed its snow and become more-or-less a scree-pile rather than mountain wasn’t enticing. So we spent our time discussing our route for the next day, trying to stay out of the sun, cooking food and bouldering on some rocks a short walk towards Craigs. At 8pm we chose to go to bed early so we could have an early morning alpine start at 2am. The forecast was 70 degrees in the park the next day and we didn’t want to risk any wet slide avalanches. Our decision to camp in the trees was worth it, there was almost no wind and we got amazing sleep. Just as on our Shasta ascent last year, we had the good fortune of a nearly full moon as we started up from camp via a snowed over river and through the tree line up towards the base of Lassen at 2:45am. Through this easy section we would only use our headlamps in the shadows of the trees to see each other post-holes. After about 45 minutes we were to the base of the Northwest ridge. We kept left, planning to cross the ridge through a shoot and then stay on the right of it the rest of the way. However, once we rounded the first rocky outcropping on climbers left we somehow managed to miss this ridge cross over and wound up ascending the Northern face between two ridges the rest of the morning (see route). In the beginning the snow was mixed in composition. Sections of it you would kick through powder to the ice underneath while later on it all became a bare, firm, ice-crusted surface that was made for crampons. The wind was light and I was in awe of the beauty of our moon-lit climb and absence of anyone else on the mountain. After over an hour we reached the V where the two ridge lines began coming together. This section became much more steep than anticipated, over 45 degrees, and made some people in the party uncomfortable. However, demonstrating a technique to use the ice axe in either self-arrest position or with one hand on the head made everyone feel more secure. This technique involved climbing directly up slope, driving the axe into the firm snow each time while leaning the torso very close to the slope (sometimes on the knees). Providing a lot of traction and setting everyone up to immediately self arrest if anyone fell (no one did). After getting on top of the joined ridges, the slope went back to the 30-40 degrees of before. 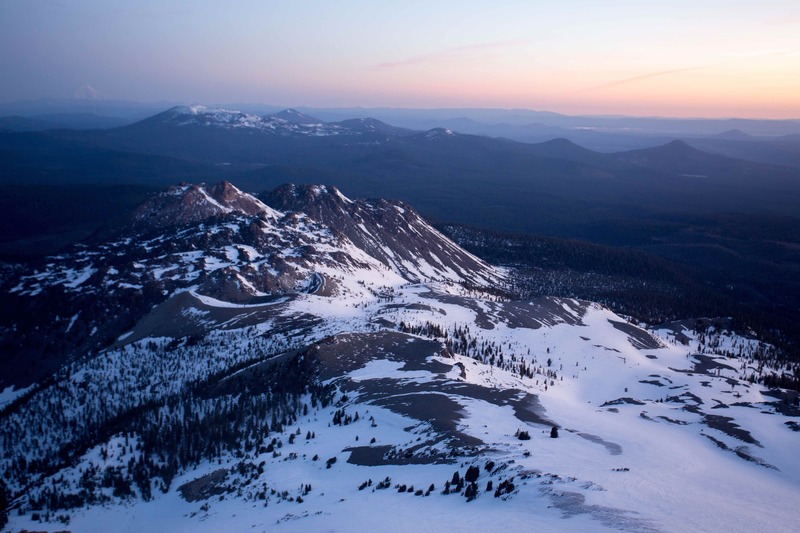 The sun began rising on the East side of Lassen and the wind picked up from around 5-10 to around 20 mph. Over the next hour or two we worked our way up to around 10,000 ft where we encountered rock bands above and to the right of us. Any disturbance of a rock. Even an inch would send it flying down the mountain, picking up tremendous speed down the steep, slick slope. This provided a lot of risk considering one pair of us was descending below us due to a climber not feeling well. Additionally, my partner wasn’t feeling comfortable with the more mixed traverse we would have to do stepping on rocks with crampons and using our ice axe on rock edge to help balance. So we too decided to descend just below the bowl that would bring us the last 500 ft to the peak. Had we kept on the right side of the ridge instead of getting off track its possible we could have gotten to the bowl without crossing a rock band. Likewise going around the Northern most ridge would have been disastrous given our moderate avalanche forecast and Eastern features had cornices and wind-loaded snow. View from our turn back point. Rock bands on left. 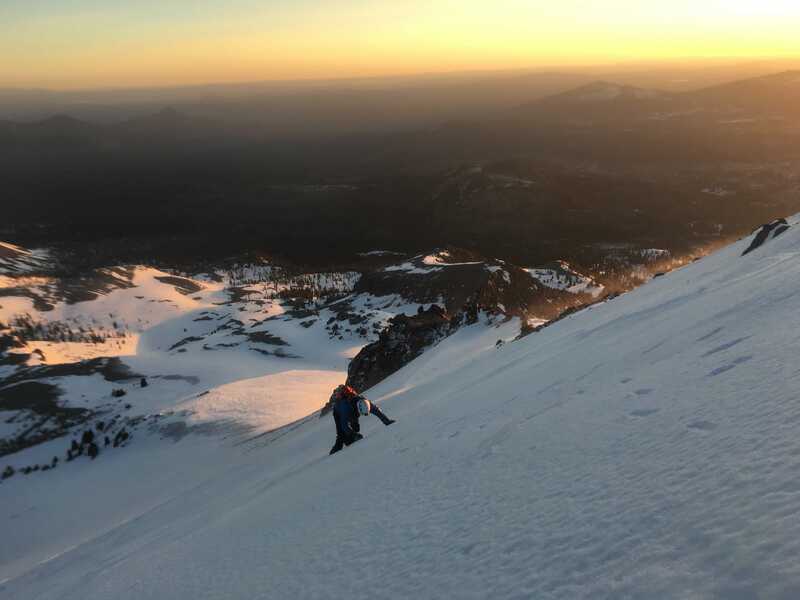 With the sun risen at around 7:20am we down climbed half the face before taking off our crampons and doing a speedy glissade down still quite slick snow. Reaching our camp by 8:40am. We ate, packed up our tent and were at the car by 10:45am. 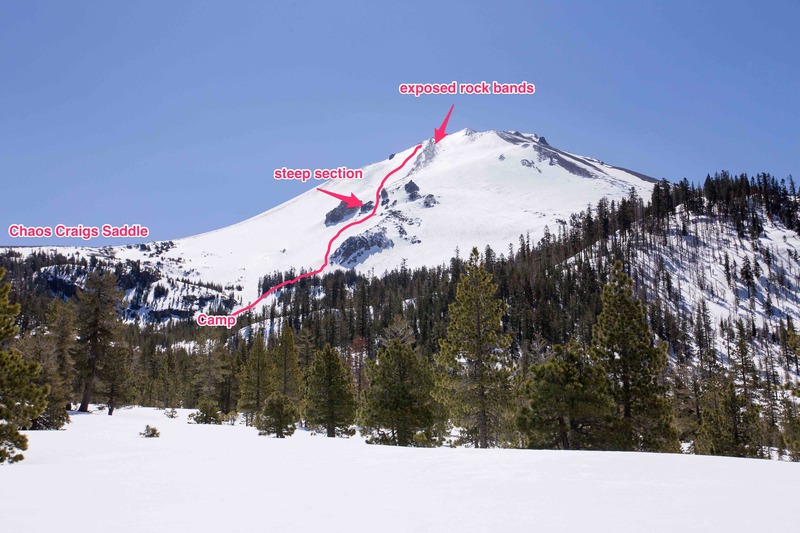 I’m excited to try another route some other time for Lassen Peak. The mountain looked quite easy from below but was steeper than I expected when on it. Also, I didn’t see another person the entire trip and it was very cool experience to see all the surrounding ridge lines, peaks and even Shasta in the distance. The one thing I might change is trying this peak a little earlier in season so these rock bands were slightly more covered, but we definitely benefited from the later in season hard snow.